Get this week's Weekly Deals while you can! It's all good stuff, but if you love framelits this week's deals are AWESOME! 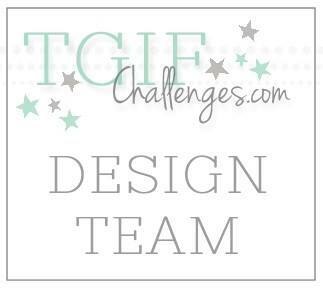 Do you want to make a dimensional folded window to perfectly frame and highlight a focal point? 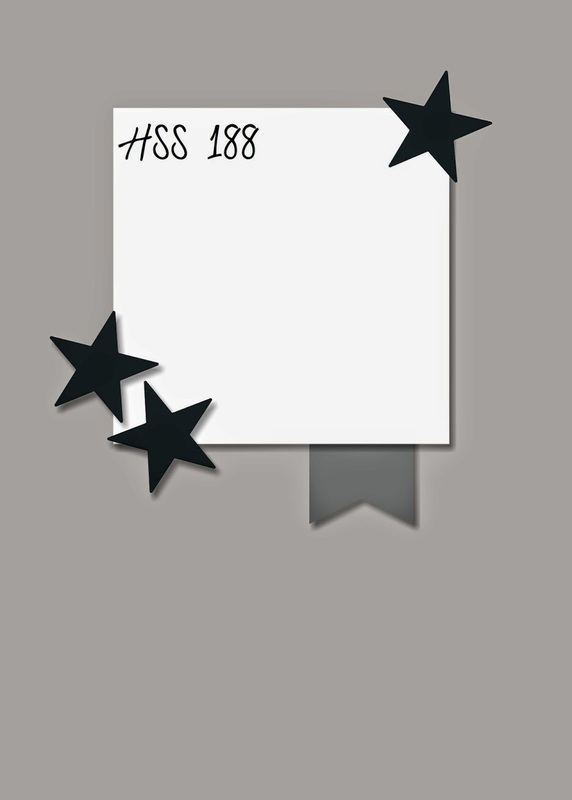 Well here is an easy idea using a Diagonal Score Plate in your Simply Scored Scoring Tool. First arrange the Diagonal Plate in the Simply Scored Scoring Tool, next place a 4" square piece of DSP in the upper corner, then score at 2" and 3". Repeat the scoring on all four sides of the DSP and then fold back on the 2" scorelines and inward on the 3" scorelines--ta da! It's that easy. 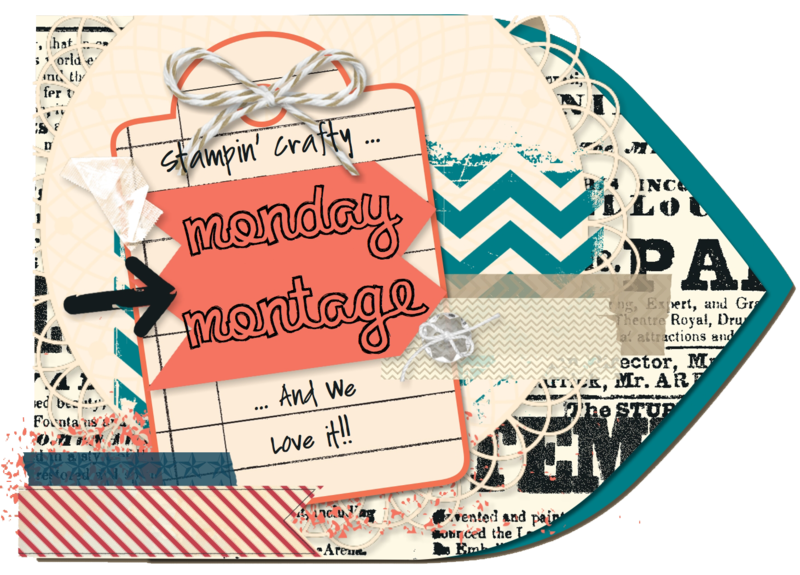 With all the fun and new DSP packs in the new Stampin' Up! catalog I just can't seem to get enough bright color combinations. 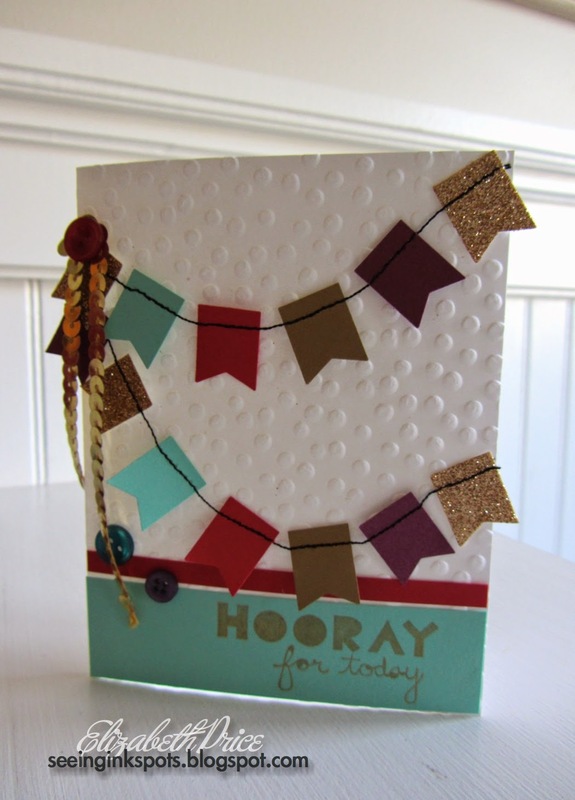 For this card I robbed my Chalkboard Banner Simply Create Kit of one of the pennants to add all that spirited color. The kit includes 30, yes I said 30, pennants so I don't think one missing will make a difference. With the fun pattern papers I juxtaposed the crochet ribbon--I love the blend of funky with delicate softness. 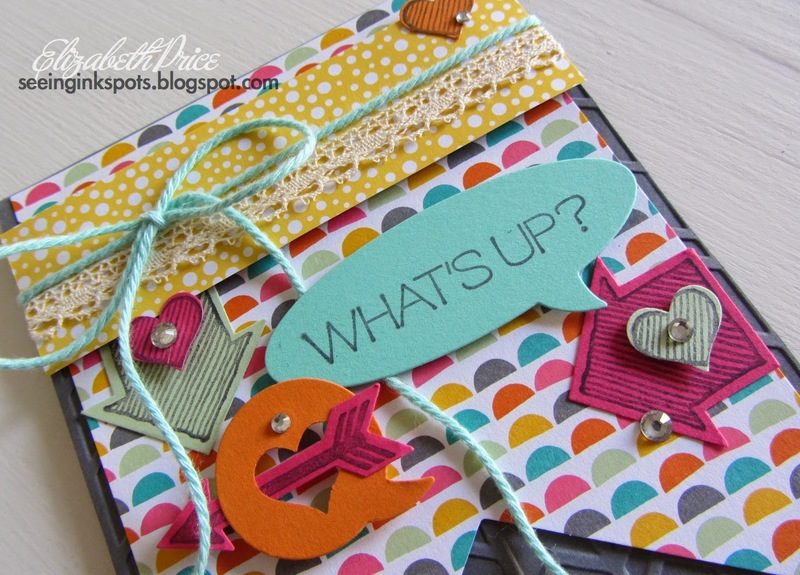 To go with the paper I looked for a stamp set that "fit" the style so I grabbed the What's Up stamp set and the coordinating What's Up (arrow) Punch along with the Itty Bitty Accents heart punch and the Word Bubble Framelits. Do you ever hold on to mementos and things like ticket stubs or programs? 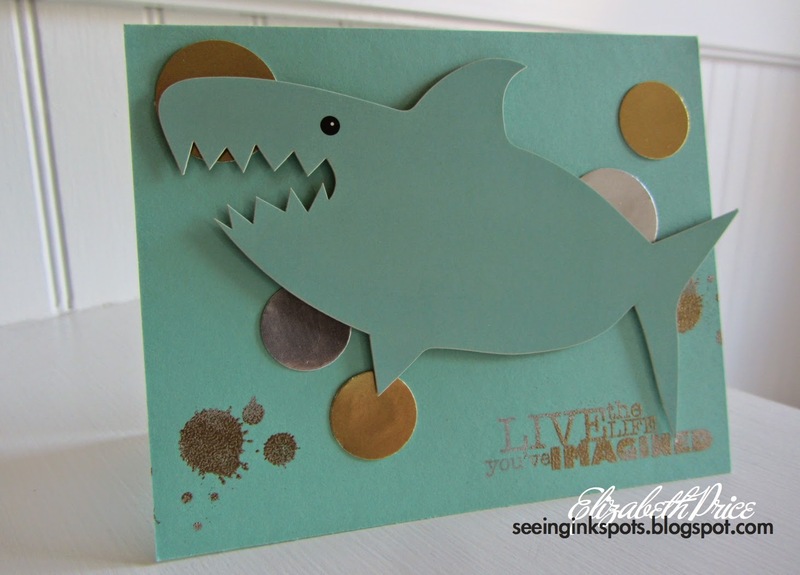 I do all the time and this shark ticket from the Manager's Event at Stampin' Up! 's Leadership has been beckoning me for months to include it on a card. 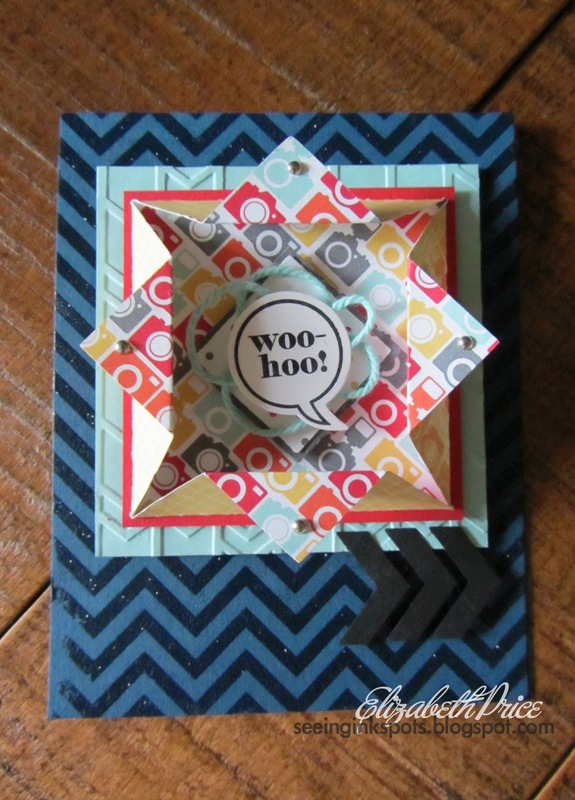 So, I finally got to it and made a fun and funky card perfect for someone with a spunky sense of humor. 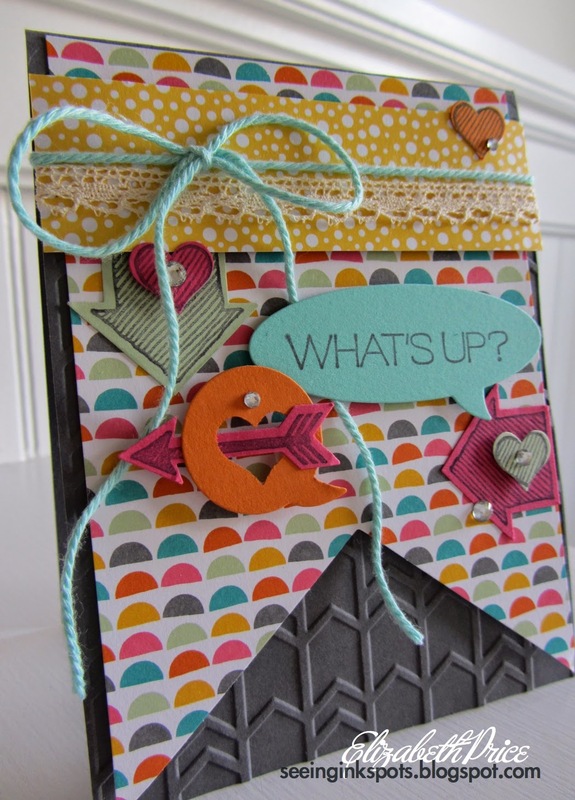 On a Coastal Cabana card base I stamped the splats from Gorgeous Grunge and the greeting from Really Good Greetings with Silver Encore Ink. 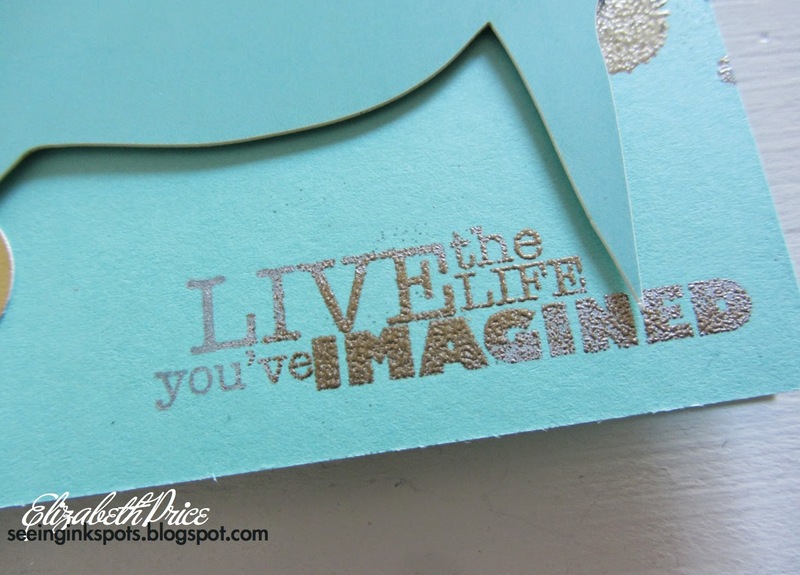 Then a sprinkled Gold Embossing Powder here and there to get a two toned effect. A few punched circles in Gold and Silver Foil and the card was complete. 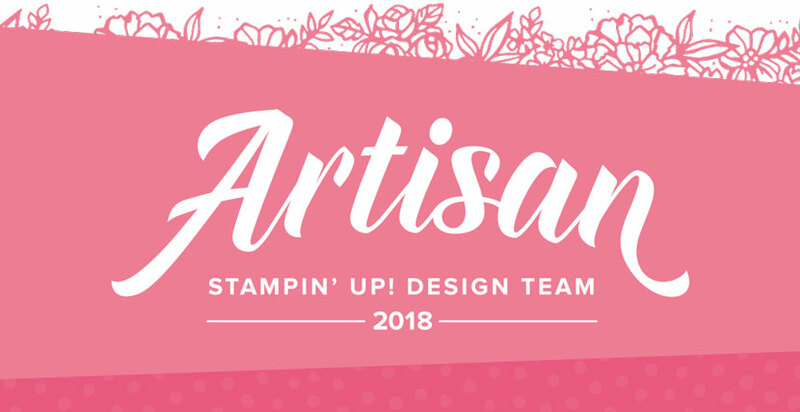 The number one item on my list of things to buy from the new Stampin' Up! catalog was the Little Letters Framelits. I could barely wait to get my hands on these. It was like that anticipation for Christmas morning--I really wanted these. 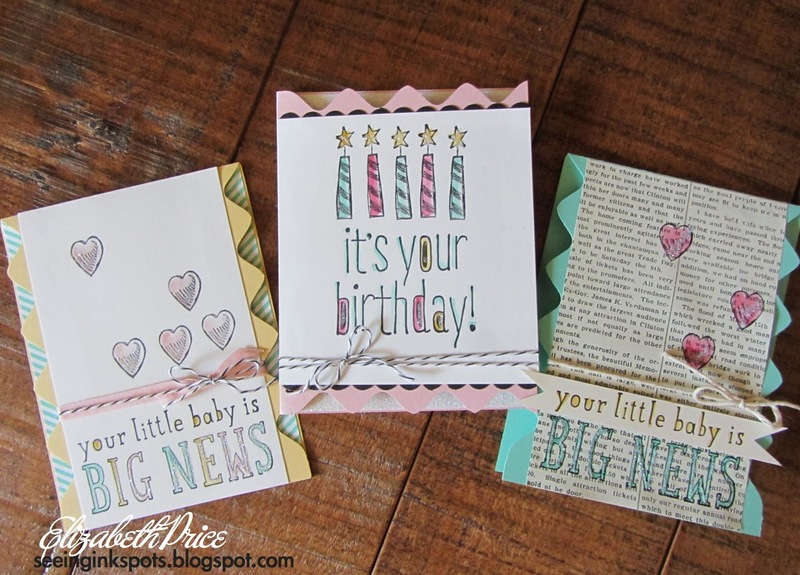 When I saw the sketch challenge at Hand Stamped Sentiments I knew exactly what I was going to do. 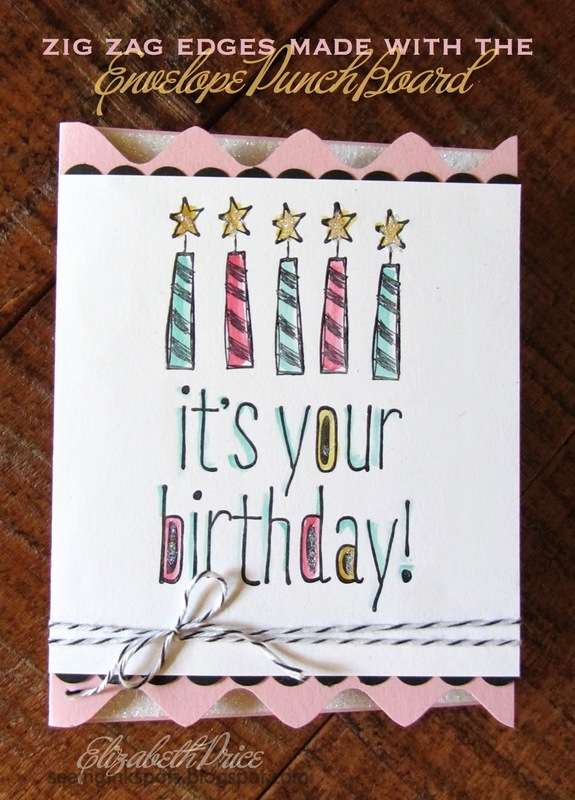 I was going to make a birthday card with a clean and simple look. My colors/papers are Daffodil Delight, Lost Lagoon, and Pumpkin Pie card stock along with a piece from the All Abloom DSP stack. 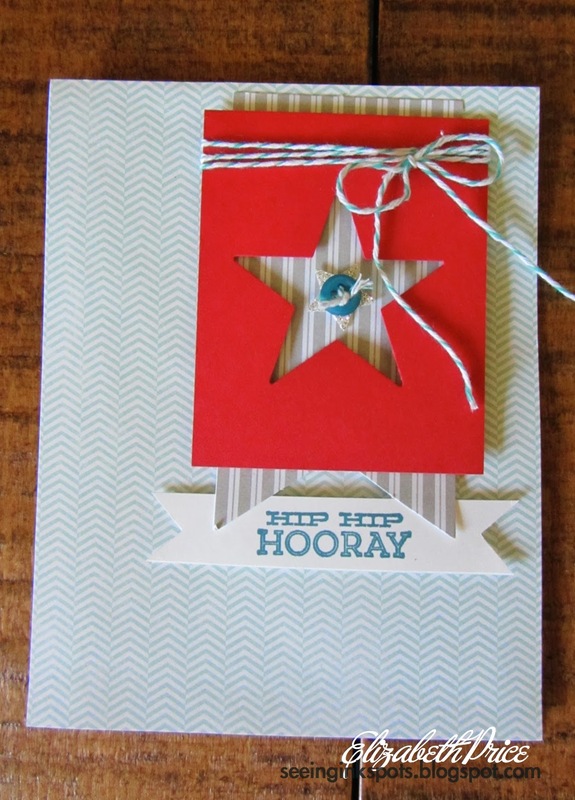 The stars were punched with the Itty Bitty Accents Punch Pack and they are each finished with the Basic Rhinestone. Two tiny scraps of Pumpkin Pie Chevron Ribbon and I was done with the card and sketch. 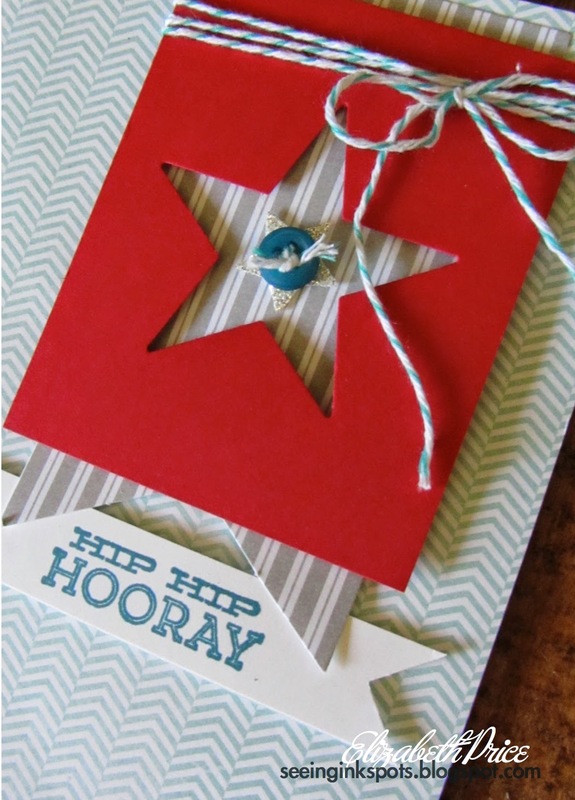 How about another card, this one is clean and simple, made with scraps on my table? A piece of I am Me DSP, a tag and twine from last year's Tag A Bag kit, a Silver Glimmer star, and a piece of Real Red card stock and I almost had everything I needed to finish this card. All I pulled out from my stash of supplies was a Regals Designer Button, a greeting from Hip Notes, and an Island Indigo stamp pad. "Hooray for today" summer vacation has officially begun. Even though I am not in school I still feel that sense of freedom when Logan is finished with all his classes and projects. 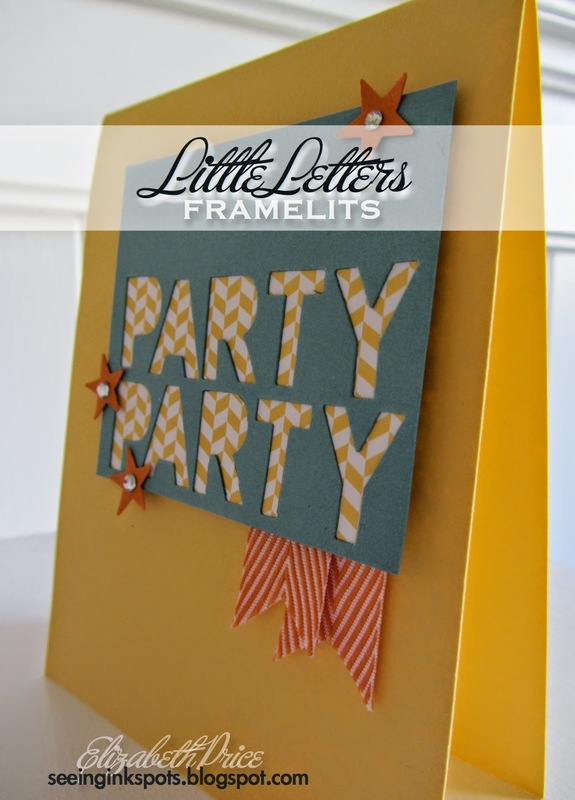 So, why not share a party styled card made with scraps on my table. 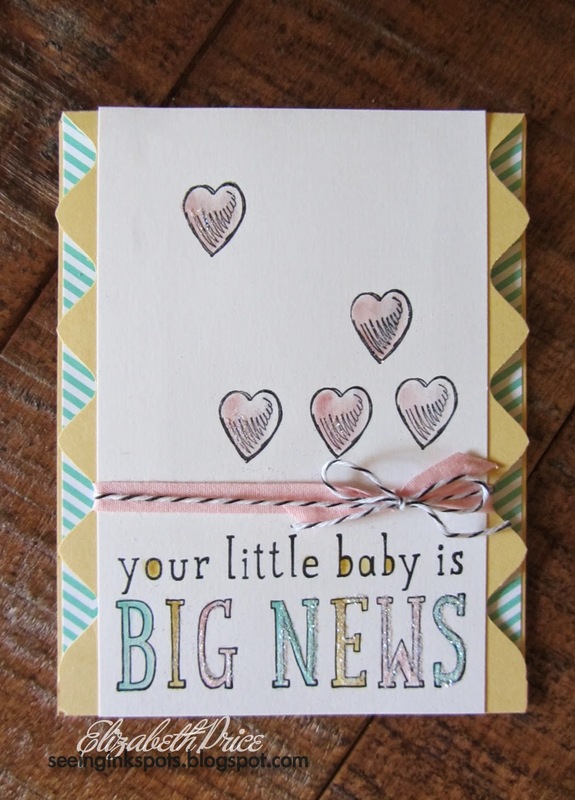 I love these types of cards because they are unpredictable and always bring a smile and sense of accomplishment. The colors for the flags were inspired by a sample in the new catalog on page 20. While not exactly the same the sample was the motivator for the sewn banners and the colors. 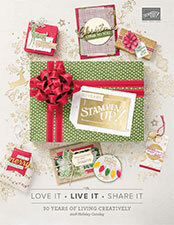 Speaking of new catalog I was happy to see the Decorative Dots Embossing Folder be carried over from Sale-a-Bration. I think it blends perfectly with the Gold Sequin Trim and the Regal Designer Buttons. 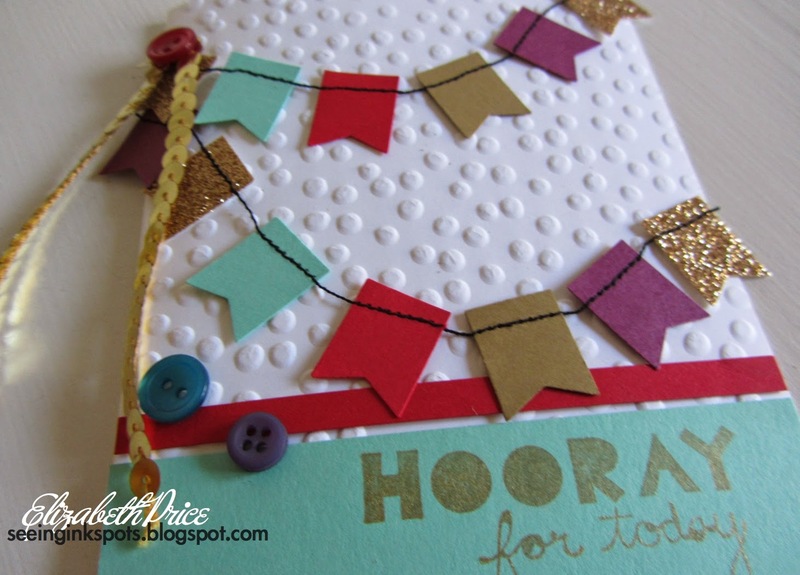 To go with the sequins and glimmer paper I used Gold Encore Ink to stamp the greeting from the Geometrical Stamp Set. To me nothing says "hooray" better than banners and sparkly stuff. I hope your summer is all about celebrating, visiting and relaxing with family and friends. 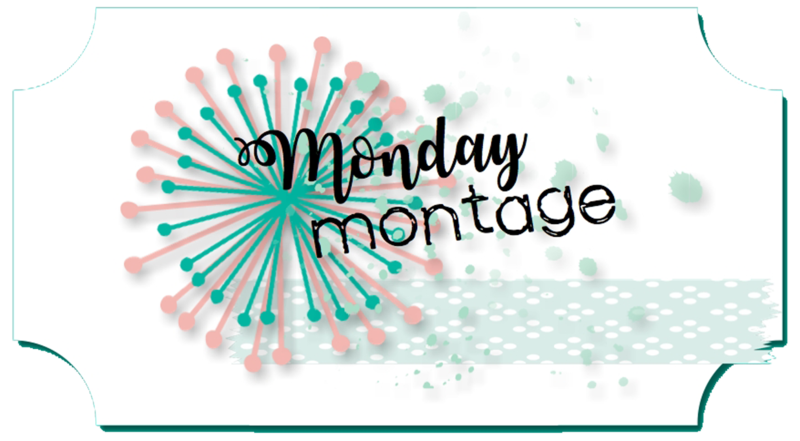 In the next few minutes visit some blogging friends and follow our Monday Montage Hop. 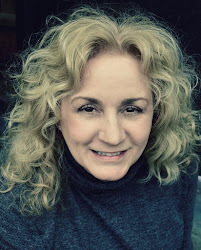 Julie is next on the hop so click on over and enjoy. 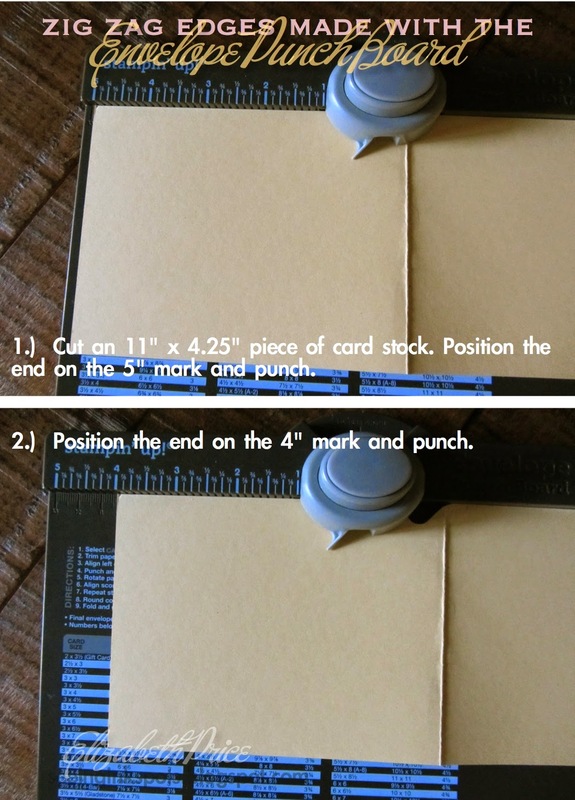 Big news, I finally have a super quick "how to" make zig zag edges with the Envelope Punch Board. 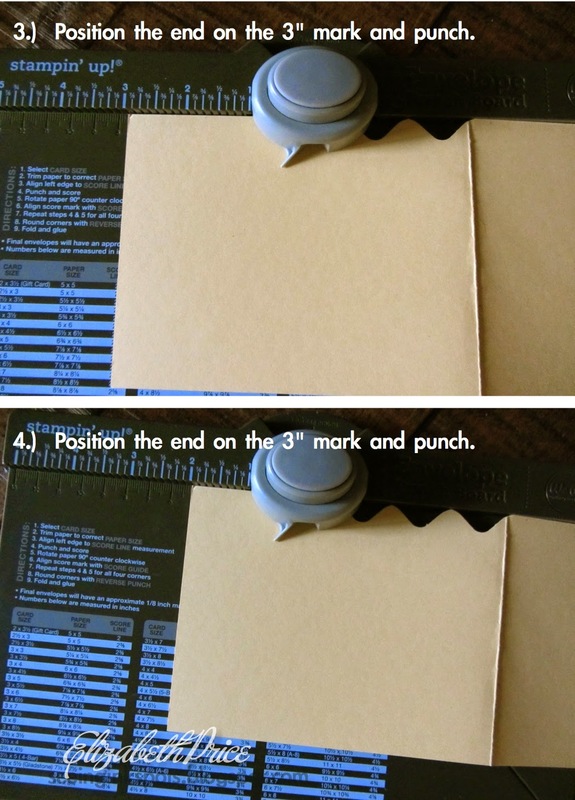 Just take a look at the pictures and then go grab some card stock and your punch board--it's that easy. Now you're probably wondering why that is such big news. Well it's not, but the stamp set is. I just got this new set last night and it's called Big News. It is one of my favorite set of stamps in the recently released Stampin' Up! Catalog. If you love sets filled with an array of typography than this set is for you. 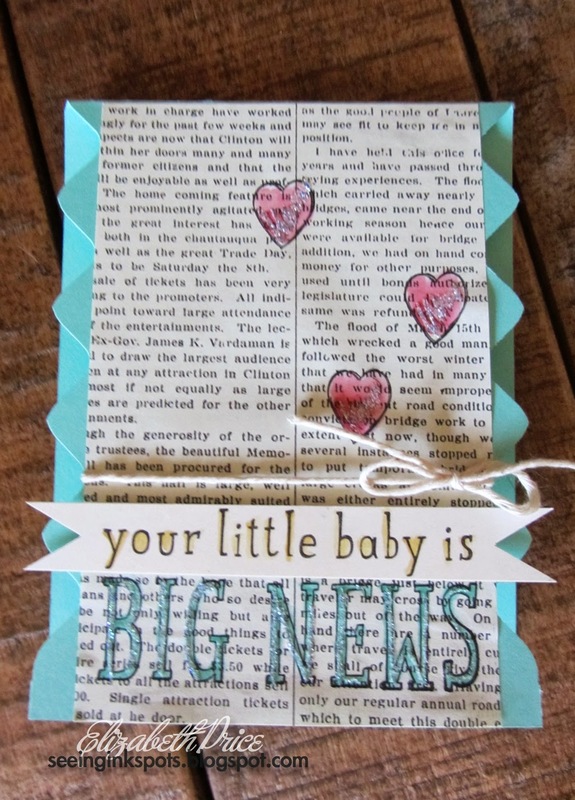 I added some new ribbon and twine to this first baby card. The Black Bakers Twine is just what I have wanted for quite some time. So, a big thank you to SU! for including it in the new caty. The pink ribbon is the Blushing Bride 1/4" Cotton Ribbon, it's scrumptious! 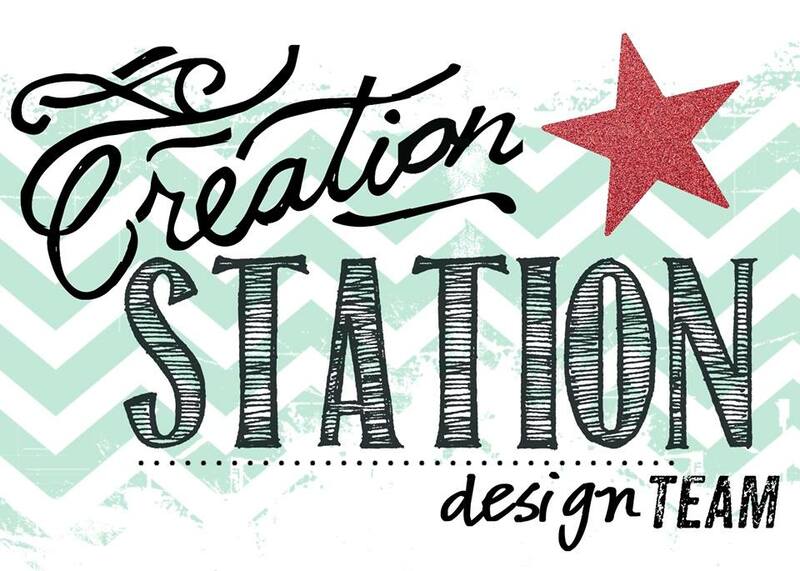 I stamped on Shimmer White card stock with Jet Black Staz On and then added ink with an Aqua Painter. I filled my Aqua Painter with rubbing alcohol for quick drying and better blending. And what card wouldn't be complete without some glitter? It's my obsession, I just had to add a touch of sparkle. 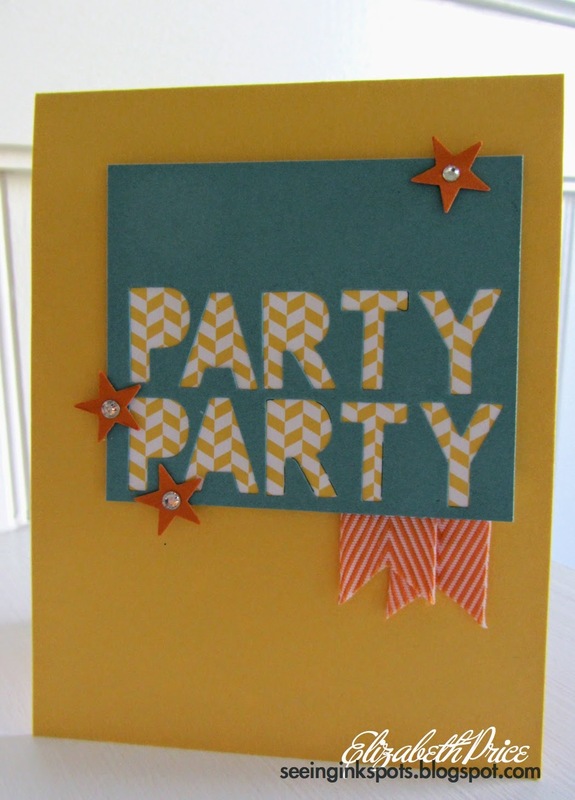 With my Two-Way Glue Pen and Dazzling Diamonds Glitter I finished up this spunky baby card. How about one more card? Same layout just different paper. The background paper is the new light weight DSP. It too is super yummy and was a must have paper for me and so it made in on my very first order from the new caty. Sometimes the most simple cards can be the most stylin' and effective. 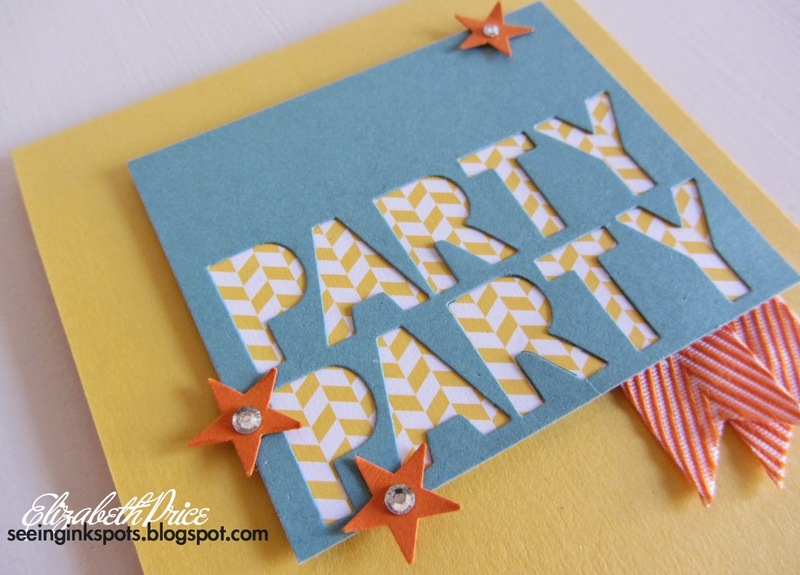 I love how this card whipped together and the ease of the layout and design. I mean who says cards have to always be a complicated work of art? Don't get me wrong, I love making detailed and uniquely designed cards, but sometimes the clean look can be so effective. 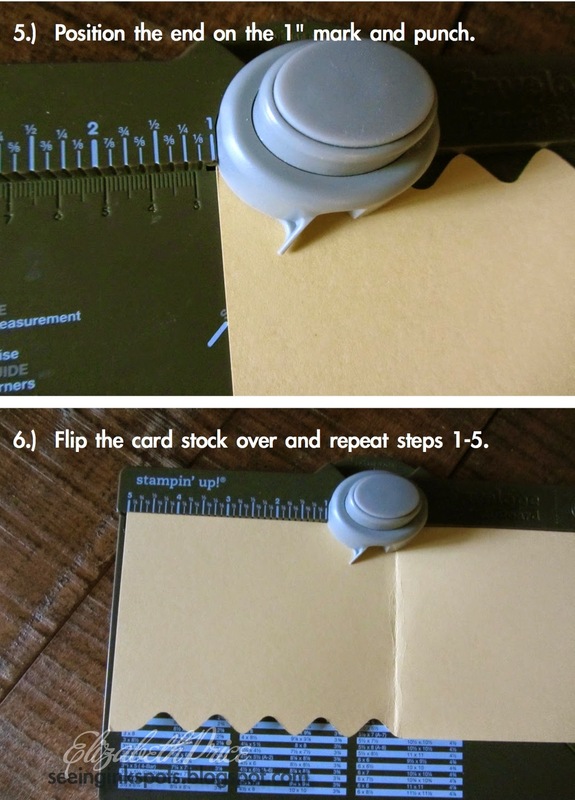 For this card I started with a Pistachio Pudding top fold card base. To that I added a panel of Blushing Bride card stock in which I cut a thought bubble using the Word Bubbles Framelits. 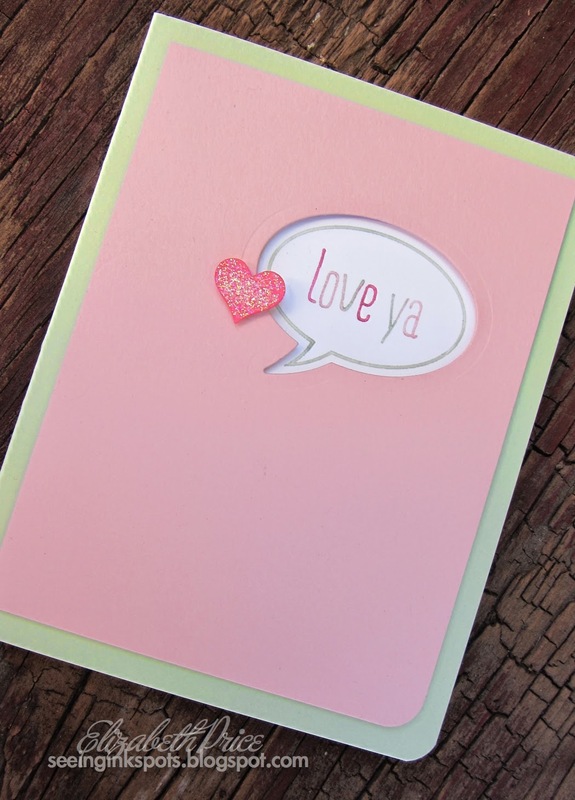 On a scrap of Whisper White card stock I stamped the "love ya" greeting from the Just Sayin' stamp set with Stampin' Write Markers. To give the card a dose of design I used Stampin' Dimensionals when assembling the stamped layer behind the Blushing Bride panel. 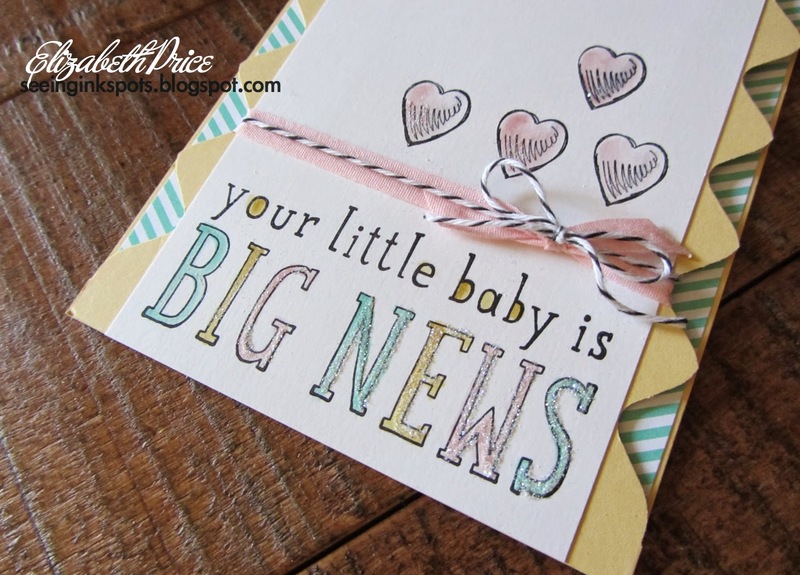 To finish the card I punched a Strawberry Slush heart from the new Itty Bitty Accents Punch Pack and then adding Dazzling Details for a splash of sparkle. 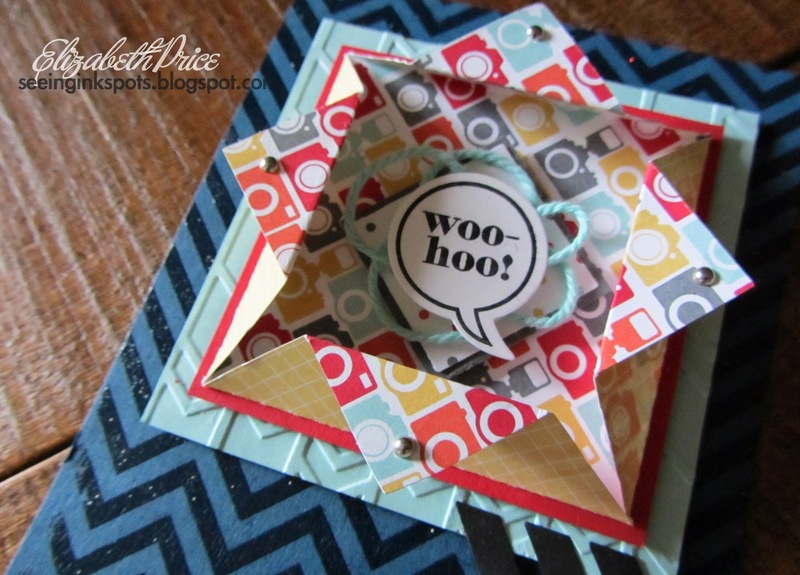 One last detail was to round the bottom corner with the new Project Life Corner Punch. 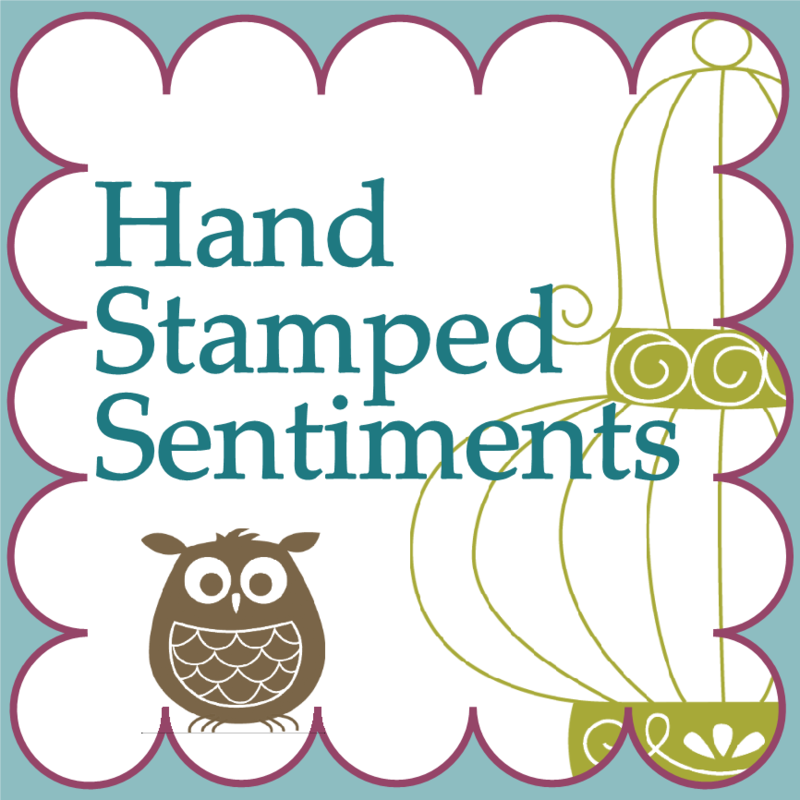 If you love the soft and summery colors of my card be sure to visit the Hand Stamped Sentiments blog for an array of designs crafted by the entire team.